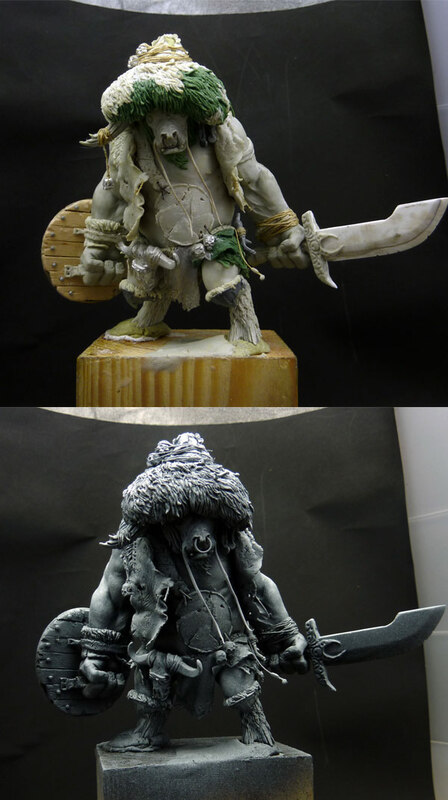 Now you got a reason to be scared - Dschingis Cow is now ready for some paint... before i start i will change some minor things i saw after priming (at the blade for example), this is my vision of the Sculpt by Allan Carassco for FIGONE. Here you can see the basic model... Oh yeah, i really got to say that i love my Dschingis Cow :) - what do you think? I'm sure it will be a killer painting!!! Yeah, another masterpiece! :D can't wait to see painted! :) cheers! When you are doing the priming for zenithal lighting, do you have any tips for putting on the white primer? I've recently tried it, and it worked out, but i didn't get that soft and natural looking gradient. My primer built up too much on top, and not enough on the bottom. yeaahh this rocks :D This gonna be a masterpiece. I paint fast in the start and in the end i guess, very, very slow... like always, no idea if it is getting a 'masterpiece' - as i am swinging the brush freely the last weeks i always find out what is important to me while painting. It is not thinking about creating a masterpiece, not thinking about the past, not thinking about future, just paint in that moment... like i try to sit when i sit :) - thanks glad you like him!